At His Feet my heart-rose. Sri Chinmoy, mystic and a spiritual teacher who dedicated his life in the service of humanity, entered into Mahasamadhi - the mystic process through which spiritual Masters exit the body - and passed behind the curtain of Eternity on the morning of 11 October 2007. Indeed we are from God and to Him is the Mahasamadhi, the final journey. Respected and loved worldwide, Sri Chinmoy's philosophy for world peace was manifested through a wide array of activities, ranging from literature to art to sports to music. The universal nature of his philosophy embraced and encouraged people of all backgrounds, faiths and nationalities to work together for peace. Hailed as a modern day renaissance man, Sri Chinmoy has sought to combine the spirituality of the East with the dynamism of the West. He made prolific and eye-opening contributions in the fields of literature, poetry, art, music and athletics. Sri Chinmoy used strenuous exercise and art to spread his message of world harmony and inner peace. He spread his philosophy through his own way of life, exercising and creating art and music. In his 43 years in the West, he endeavored to inspire and serve mankind with his soulful offerings - his prayers and meditations, literary, musical and artistic works. He drew attention by power-lifting pickup trucks and public figures like Muhammad Ali and Sting. He slept only 90 minutes a day, he said, and when he was not traveling to perform in concerts and spread his message, spent the rest of the time meditating, playing music, exercising and making art. His followers said he had written 1,500 books, 115,000 poems and 20,000 songs, created 200,000 paintings and had given almost 800 peace concerts. 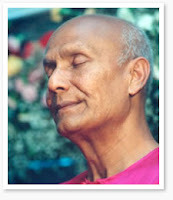 Drawing upon Hindu (Non-Dual, Vedanta and Vaishnavism) principles, Mr. Chinmoy advocated a spiritual path to God through prayer and meditation. He emphasized "love, devotion and surrender" (which is the same universal mystical principles) and recommended that his disciples nurture their spirituality by taking on seemingly impossible physical challenges. In the 1970’s, Mr. Chinmoy was a guru to several prominent musicians, including the guitarist John McLaughlin, who for a time ran the Mahavishnu Orchestra, a name given it by Mr. Chinmoy, as well as the bandleader Carlos Santana, the singer Roberta Flack and the saxophonist Clarence Clemons. Sri Chinmoy Kumar Ghose was born in 1931 at Chittagong, in what is now Bangladesh. From the age of 12, he lived in an ashram. He immigrated to New York in 1964 to work as a clerk at the Indian Consulate. He opened a meditation center in Queens with a philosophy of celibacy, vegetarianism and meditation and attracted hundreds of followers, many settling near his two-story home on 149th Street. To achieve spiritual enlightenment, he advocated extreme physical activity, including weight lifting, distance running and swimming. Sri Chinmoy leaves behind great spiritual legacy and teachings which God willing, will continue to illuminate many hearts. May God bless the soul of Sri Chinmoy, may Divine peace be upon all lovers of God.